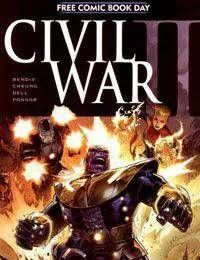 Before hero stands against hero, Brian Michael Bendis and Jim Cheung bring you a snapshot of the conflict that will split the Marvel Universe in two!<br />But thats not all! Beware the sting of the All-New Wasp! FCBD CIVIL WAR II #1 will also feature a special second story from All-New, All-Different Avengers writer Mark Waid and legendary artist Alan Davis. Be there as this mysterious new character makes their big debut! Are they friend or foe? How will their coming impact on the lives of the All-New, All-Different Avengers? The answers may surprise you, True Believer!